IPPS – Toyon Associates, Inc.
Toyon is in the process of setting up appeals for its clients related to the recent ruling that opens the door for an appeal of “predicate facts,” or factual determinations that are relevant to the fiscal year at issue but which were actually decided in a year outside of the current year in dispute. Examples of now appealable predicate facts include IPPS standardized payment rates, SCH and MDH base rates, IME/GME base year resident counts, and GME base year per-resident amounts. Click here to review the full press release from Toyon. On April 24, 2018, the Centers for Medicare & Medicaid Services (CMS) proposed changes to empower patients through better access to hospital price information, improve patients’ access to their electronic health records, and make it easier for providers to spend time with their patients. The proposed rule updates Medicare payment policies and rates under the Inpatient Prospective Payment System (IPPS) and the Long-Term Care Hospital (LTCH) Prospective Payment System (PPS), effective for discharges on or after October 1, 2018. The policies in the IPPS and LTCH PPS proposed rule would further advance the agency’s priority of creating a patient-driven healthcare system by achieving greater price transparency and interoperability – essential components of value-based care – while also significantly reducing the burden for hospitals so they can operate with better flexibility and patients have the information they need to become active healthcare consumers. These changes result in the elimination of 25 total measures across 5 programs with well over 2 million burden hours reduced for hospital providers impacted by the IPPS proposed rule, saving them $75 million. Overall, the proposed rule is projected to result in an estimated increase of $4.1B (or 3.4%) in payments to providers, ranging from 0.7% increases for smaller, rural hospitals up to 3.1% increases for larger urban hospitals in the Pacific Region. CMS is proposing a base rate increase of 1.5% for hospitals, mostly driven by a market basket increase of 2.8%. 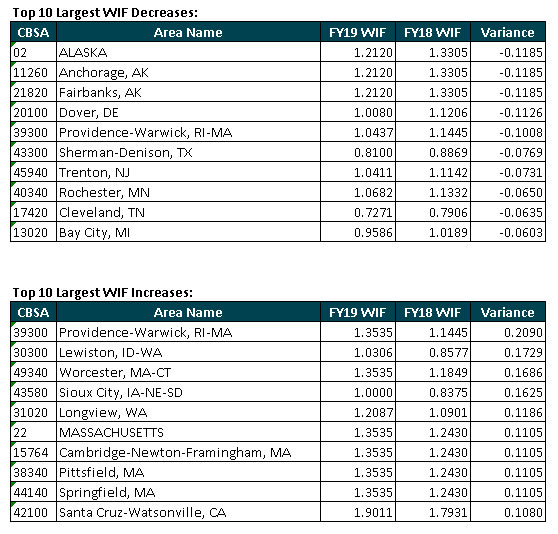 Click here for the full base rate calculation table and comparison to prior year. Effective 10/1/2018, patients discharged to hospice by a hospice program are to be included as transfer cases, as required by the Bipartisan Budget Act of 2018. The discharge status codes 50 or 51 will now be subject to the transfer policy. CMS has calculated an occupational mix-adjusted national average hourly wage of $42.948428861. Of note, 255 hospitals will receive the rural floor. Thirty-five Massachusetts hospitals will receive an additional $49M (1.4%) due to the application of the rural floor. In addition, Connecticut hospitals will also experience a significant benefit ($90M) from the rural floor. 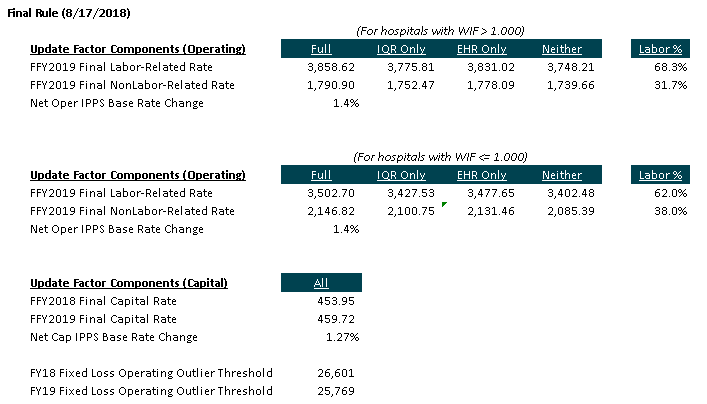 CMS has stated that only 8 hospitals out of 3,000+ IPPS hospitals in the wage index data reported “other” wage-related costs correctly. Beginning with FFY2020, CMS is proposing to remove “other” wage-related costs from the wage index calculation entirely. Based on current regulations, for a hospital’s wage data to be recognized in the rural wage index for the upcoming FFY, a hospital’s rural filing date (“lock-in” date) must be no later than 70 days prior to the second Monday in June of the current FFY, and the application must be approved by CMS in accordance with the regulations specified at 42 CFR 412.103. In the current year, this “lock-in” date is April 2, 2018. CMS is proposing to revise the “lock-in” date such that a hospital’s application for rural reclassification must be approved by the CMS Regional Office no later than 60 days after the public display of the IPPS notice of proposed rulemaking in the Federal Register, in an effort to eliminate errors. This date would then be variable dependent upon the Regional Office’s statutory requirement to approve all requests within 60 days of receipt and will also depend upon the capacity of the Regional Office to timely approve a rural status application. CMS recognizes that there are disparities in wage reporting and regulations and sees an overall need for improving the wage index system. As such, CMS is requesting public comments related to this topic. CMS is proposing to increase Medicare DSH UC payments by $1.5B, to $8.3B in FFY 2019. Although CMS is proposing to use three years of data to determine each hospital’s Factor 3 proportion, for next year’s rule making CMS is considering shifting to only one year of data (i.e., UC cost from FY 2016 cost reports). Be aware that these payments may yet change for FFY2019. CMS is considering using cost report data through May 2018, as opposed to data through February 15, 2018 to determine the final FFY2019 hospital UCC DSH payments. For hospitals that reported excessive uncompensated care on their 2014 and 2015 cost reports (i.e., when uncompensated care costs are greater than 50% of total hospital costs), CMS will recalculate the hospital’s uncompensated care based on estimates from the hospital’s next cost reporting year, if they cannot justify their reported numbers. Hospitals have 60 days to notify CMS (at Section3133DSH@cms.hhs.gov) of any inaccuracies in CMS’ table of uncompensated care data, which can be found at the link below. This includes reviewing CMS’ table of combined data for merged hospitals. After the FFY2019 IPPS Final Rule is published later this summer, hospitals will have until August 31, 2018 to review and submit comments on the accuracy of their data. Toyon will be using our S-10 UCRS database to assist our clients with confirming their data. If a hospital filed multiple cost reports in the same fiscal year, CMS is proposing to eliminate the step of combining data across the multiple reports. CMS will now use the cost report that is closest to 12 months and annualize the data. Toyon strongly recommends hospitals verify their 2014 and 2015 uncompensated care cost as published in the CMS file “FY 2019 IPPS Proposed Rule: Medicare DSH Supplemental Data File” below. Toyon has identified several issues with the CMS’ uncompensated care data in the Healthcare Cost Report Information System (HCRIS) database, so it is critical to verify that your hospital’s data is accurate. Regarding hospital financial assistance policies, CMS states “…nothing prohibits a hospital from considering a patient’s insurance status as a criterion in its charity care policy. A hospital determines its own financial criteria as part of its charity policy.” This clarifying language may help hospitals more accurately capture uncompensated care related to all uninsured accounts going forward. Finally, it is important that hospitals be prepared for CMS’ proposed new requirement of submitting uncompensated care support on future cost reports. See the section below related to Additional Cost Reporting Requirements. CMS proposed to allow “new” teaching hospitals to participate in Medicare affiliated group agreements (AGA) under certain limited circumstances. In the past, new teaching hospitals could only participate in an AGA if it resulted in an increase to the cap of the new teaching hospital. Effective for new AGAs beginning 7/1/2019 and after, this proposal would allow two or more new teaching hospitals to participate in an AGA, including a reduction to one or more of the hospital’s caps. To qualify, the FTE cap transfer would have to be among new teaching hospitals. This means that the prior restriction related to existing hospitals is still in place. Applications for these additional FTE slots are due to CMS by July 23, 2018. As required by the Bipartisan Budget Act of 2018, CMS is proposing to implement changes to the payment adjustments for low volume hospitals. Effective for FFY2019 through FFY2022, a hospital must be more than 15 road miles (i.e., by use of a web-based mapping tool) from another subsection (d) hospital and have less than 3,800 total discharges. The payment adjustment is an additional 25% for hospitals with fewer than 500 discharges, and a sliding scale is then applied for hospitals over that level down to 0% for 3,800+ discharges. 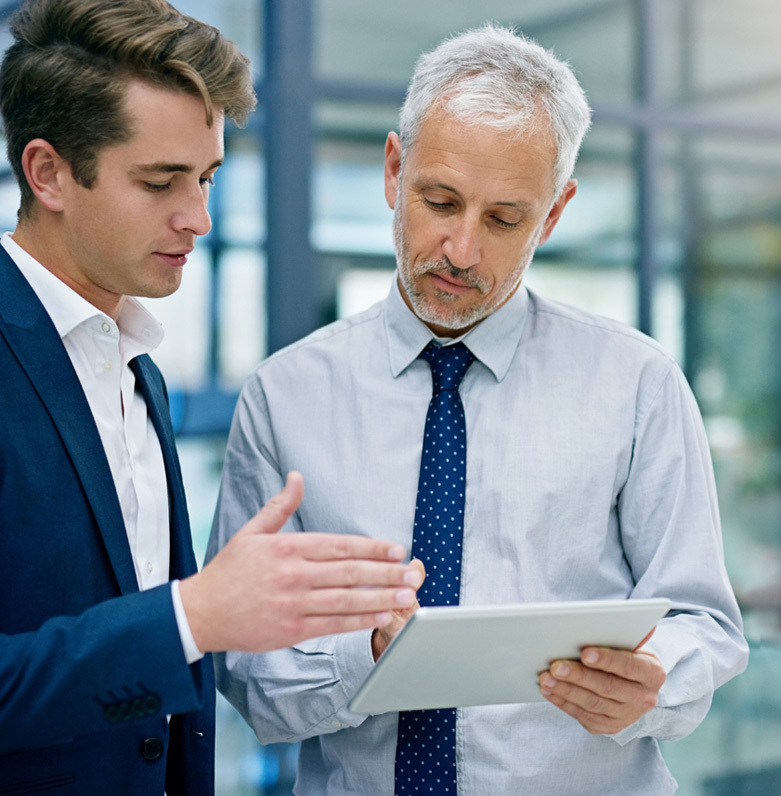 Many measures between the various quality reporting systems have been determined by CMS to be duplicative, excessively burdensome, or “topped out,” meaning that most providers consistently perform well in a measure. As a result, CMS is proposing to make the following changes to these programs. CMS is proposing to stratify measure rates by dual-eligible Medicare/Medicaid patients. CMS is also proposing to remove 19 measures and de-duplicate another 20 measures, for a reduction of 39 measures to be reported under the IQR program. CMS is also proposing to adopt 1 claims-based readmission measure. Click here for a table of the 39 IQR measures proposed to be removed. CMS has decided to remove or de-duplicate 10 measures, with the only safety measure being removed. In addition, CMS has proposed to change the names of the domains to more accurately reflect the new measures. Finally, the weighting of each domain will change. Click here for a table of the 10 HVBP measures proposed to be removed. The only notable proposed change from CMS was to clarify the definitions of “dual-eligible” and “applicable period.” No new measures have been proposed. CMS is proposing to start measuring hospital performance against peers with similar proportions of dual-eligible patients. 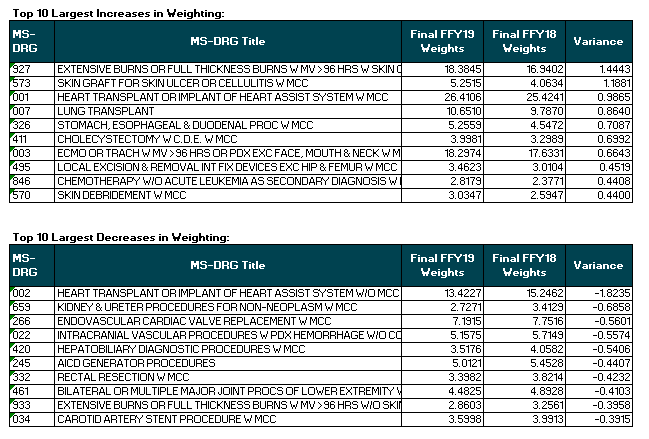 In addition, CMS is proposing to update measure weighting to address concerns raised about disproportionate weighting at the measure level for the subset of hospitals with relatively few NHSN HAI measures. CMS is proposing to rename the “EHR Incentive Program” to “Promoting Interoperability Program” to align with their plan to overhaul the incentive program by moving away from meaningful use measures to more of a focus on the patients and healthcare data exchange through interoperability. Click here for a table of the proposed new scoring methodology. CMS has proposed to update existing requirements related to supporting documentation that must be submitted with cost reports. Some of the changes are simply verbiage changes in the instructions to remove the reference to the Form CMS-339, which is no longer applicable as it has been incorporated into most cost reporting forms, and to change the reference to IRIS data, as opposed to a separate IRIS diskette, which is no longer used by most providers. Failure to submit this data will result in the cost report being rejected for lack of supporting documentation. For additional information, please contact Daniel Pelayo at daniel.pelayo@toyonassociates.com. CMS is proposing to allow IPPS-excluded hospitals to operate IPPS-excluded units. In another CMS proposal, an IPPS-excluded satellite of an IPPS-excluded unit of an IPPS-excluded hospital would not have to comply with the separateness and control requirements. CMS is proposing to remove the requirement that inpatient admission orders be written. If other available documentation, such as a physician certification statement when required, progress notes, or the medical record as a whole, supports that all the coverage criteria are met, and the hospital is operating in accordance with the hospital conditions of participation (CoPs), then written orders to admit are not required to be present in the medical record. Click here for a copy of the published rule for the LVA and MDH extension.